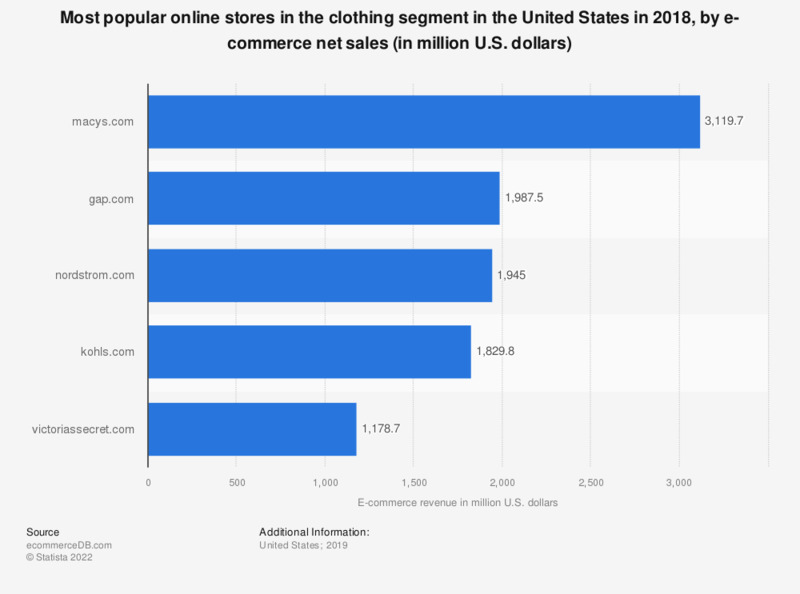 This statistic presents a ranking of the most popular online stores in the United States in the clothing segment in 2018, sorted by annual net e-commerce sales. In 2018, market leader macys.com generated 3,1 billion U.S. dollars via the sale of clothing articles in the United States. The online store kohls.com was ranked second with a revenue of 1,8 billion U.S. dollars. The e-commerce market category “Clothing” covers the digital sale of almost all types of clothing articles, including men, women and children clothing (+4 years), underwear, costumes and workwear. Toddler and baby clothes, sport and outdoor clothing as well as jewelry are not included in this category.